Ah, Snake. You were huge when you first popped up in arcades during the seventies, made a surprise visit to the beginning incarnations of our cell phones, and continue to be a fan favorite. In fact, Google has immortalized you in the form of a hidden game in Gmail (which I admit to firing up and playing). But what if there were two snakes to be controlled? Aleksey Volkov apparently wondered this as well, and created Twins Snakes as a result. Anybody familiar with the original Snakes game knows that it doesn’t involve rocket science. 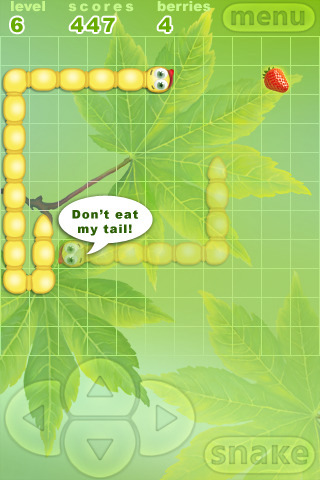 Move the snake on the grid towards the “food” (in this case, berries), and each time the snake head lands on the box with the berry, a tail segment is added on to the other end. As the berries pop up across the grid, the snake must be moved to devour them, growing longer and longer as it does so. You are allowed to phase from one side of the grid to the other (moving off-grid on one side will cause the head to appear on the direct opposite side). Traditionally, if the snake runs into its own body, the game is over. Aleksey Volkov’s game is interesting because there are two snakes instead of the usual one. One snake will be the “main” snake, and its twin will be a faded shade; whatever move you make with the main snake, its twin will move in the opposite direction. Adding a tail segment depends on whichever snake eats the berry, so the snakes won’t grow at the same rate….but they still cannot bump into themselves or each other. This gets harder to avoid as both segments will grow. 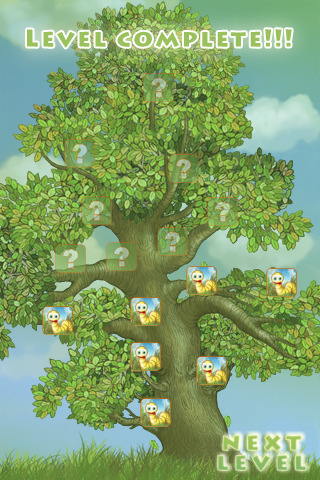 There are over 15 levels to play on Twins Snakes, each slightly more difficult than the last. I’m a fan of the original Snake, and I find this version to be a welcome addition to the family. Besides the obvious, the main difference is the huge upgrade in graphics–Twins Snakes is a long way down the road from the original 8-bit version. Twins Snakes is lushly decorated with pleasing colors, even if the snakes are a little silly, and the forest sound effects add perfectly to the ambiance. The music goes rather well with the game, and the controls are a simple four-way D-pad. What’s different (and I found this a little odd) is that unless you manage to curl your snakes into a really inescapable knot, the game only warns you that the move you’re about to make cannot be done. There’s no instant death, so you become rather complacent when playing Twins Snakes. Otherwise, there is absolutely no reason not to try out this free version of an old favorite. AppSafari review of Twins Snakes was written by Julie Guan on December 24th, 2010 and categorized under App Store, Free, Fun, Games, Puzzler, Strategy. Page viewed 3392 times, 1 so far today. Need help on using these apps? Please read the Help Page.